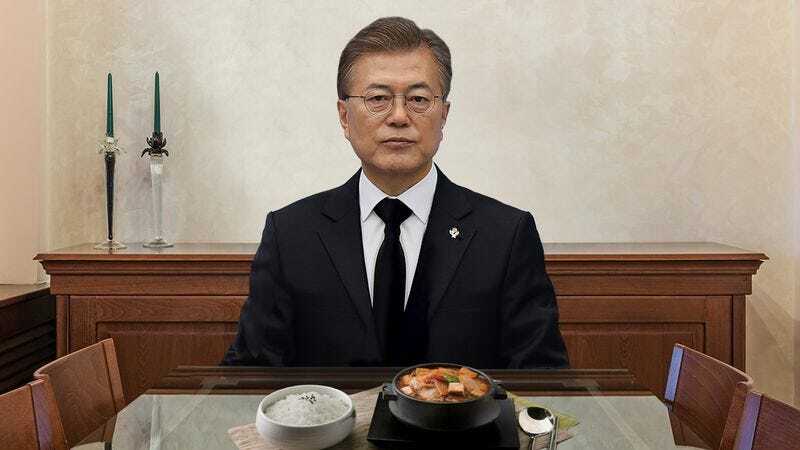 SEOUL, SOUTH KOREA—Demonstrating his country’s own might after its northern rival launched a ballistic missile over Japan, South Korean President Moon Jae-in reportedly ate a full, balanced meal on Wednesday in a show of strength against North Korea. “At approximately 7 p.m., the president sat down and enjoyed a healthy and filling traditional Korean dinner,” said one observer of the East Asian country, adding that the meal appeared to have contained a protein, a side of fresh vegetables, a grain, some cheese, and, in a particularly aggressive gesture, a variety of condiments for added flavor. “Moon has enjoyed snacks and light lunches before, but this tasty, yet nutritious, meal seems like a signal that South Korea refuses to back down from the provocations of the North, while the red bean paste cookies eaten for dessert seem like an even further escalation.” Sources also indicated that, in another show of force, President Moon turned on the lights in his residence later that evening.